The agile methodology has inspired new ways of working in a huge variety of industries, from sales to financial services. We have even heard of it being used for house renovation projects! A fully agile way of working may not be suitable for all organisations but taking inspiration for team management is increasingly common and can significantly enhance productivity. The core principles of agile, which many modern organisations use to a varied extent, are iterative working (use of sprints), communication (short customer feedback loops and regular project reviews) and quality assurance (through improved working methods). You can read the Agile Manifesto in full here. At Iken, we use elements of agile every day, both within and outside our software development team. Earlier this month, a selection of the Iken team attended Agile in the City: CEO Tanya Corsie, Head of Product Al Frisby, Product Owner Alex Wakeling, Scrum Master Jordan Robins and Testing Team Leader Magda Skowron. Held at Bristol’s M Shed, this was a great event for any organisation using agile on a daily basis, with some useful information about leadership as well as practical agile techniques and workshops. For certain meetings, it can be a good idea to set up an open agenda. Create set agenda points but make them questions for the group as opposed to statements or comments. What this does is to encourage discussion, which is a great idea if your goal for the meeting is to take your team on a journey with you. Setting and defining a good strategy is challenging. Once you have an idea of the strategy you want to put forward to your team, put it through three key tests first: The Yeah Right test, the So What test and the Yes! And…? test. Yeah Right: can you get buy-in? So What: is there a need for it? Yes! And…? : is it achievable? These tests prove your strategy is believable and attainable, and that it includes definable goals with demonstrable benefits. Human beings are not perfect. Teams can only work productively if they are allowed to make (occasional) mistakes. Failure is not a bad thing and not everything is going to work all the time. Create a psychologically safe environment by allowing people to communicate about their challenges. Quickfire, daily scrum meetings are designed to improve the quality of team collaboration. Direct communication, rather than a flurry of emails, results in increased productivity and transparency, and keeps everyone on target. During a stand-up, teams answer three questions: what did you do yesterday? What will you do today? What are your blockers? At Iken, we use another approach. 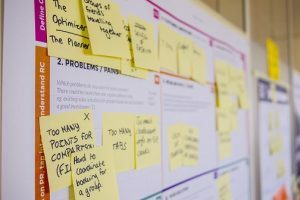 We go through each project section on our Scrum Board and everyone gives an update – we find this to be quicker but the method you need will completely depend on your organisation. Alastair Lee, Co-Founder of Pilot Works and Former Digital Product Director at Time Out, highlighted the need to always question your own assumptions during his talk. It may be crucial to maximise productivity, but it creates waste if your team are working hard on the wrong thing. Integrating processes for understanding what is valuable to users helps mitigate this. Sylvia Macdonald, Development Manager at NewVoiceMedia, gave us the non-technical perspective on continuous delivery. The company managed to speed up their release cycles from weeks to days by improving communication processes. A physical film clapper was used to communicate when one part of the project was done, instead of an email, and placed on the desk of the next person in the process. With this information now front of mind, due to the physical representation, activities were completed much faster. How can My Team use Agile? Though we would not advise a full agile implementation for most non-technical organisations, the core principles can be helpful to anyone. Using elements of agile at Iken has certainly helped us maintain a high-quality software product that is constantly informed by regular user feedback and internal reviews. However, there are occasions where waterfall works best. Agile by definition means you don’t know where you’re going, but many non-technical projects will have end goals. Instead of full agile, use agile techniques to boost communication in goal-led projects, and break down long-term objectives into small, achievable goals to ensure your team stays on track.